For all those who have been in love and wished that they could run away together, defying the world around them regardless of the consequences..... These are the consummate prints of elopement. ONE MILE FROM GRETNA - Our Governor in sight - with a screw loose ! 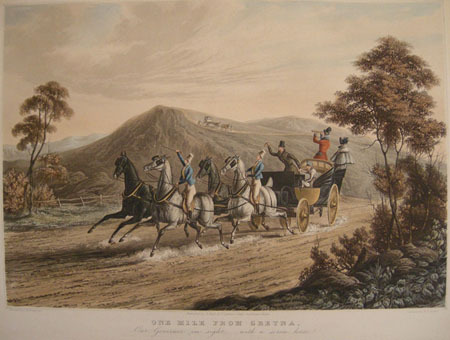 The unpretentious little village of Gretna Green located one mile inside the borders of Scotland on the historic coaching road between London and Edinburgh, and as such, was the goal of enterprising runaway couples from England. Under a more liberal Scottish law that existed before 1856, all that was needed to constitute legal marriage was a solemn declaration of willingness, before two witnesses: residential qualifications were not necessary. The enterprising blacksmith at Gretna Green, for a consideration of course, would hastily perform the rough and ready formalities. He did rather well with his sideline, joining over 1,000 in wedlock in front of his anvil. Once the word got about of the lucrative trade, the Innkeeper of the Toll Inn decided that he too should get a piece of the action, over and above his tariff for lodgings, performing an 'all in' package for some 1,300 in six years. A beautiful and delicately hand-tinted pair of original aquatint engravings, depicting the trials of elopement for a young woman and her lover. See also A FALSE ALARM ON THE ROAD TO GRETNA - 'tis only the mail.